8.5x11 inches. Music for Brass No. 801. 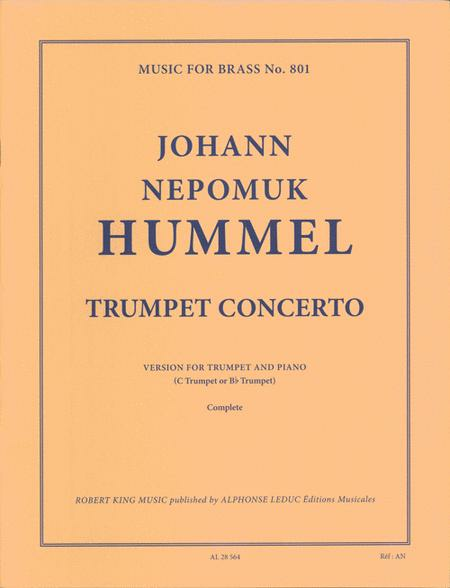 Written in 1803 by Johann Nepomuk Hummel (1778-1837), this Trumpet Concerto in E-flat Major is a classical piece of the trumpet repertoire. Composed in the spirit of Mozart, and initially for the keyed-trumpet, it was re-discovered in 1958 by a Yale student after 150 years of inertia due to the obsolescence of the instrument for which it was made. This edition offers a transposition in E-flat Major (initially in E Major) adapted to the instruments in use today. The other instruments to be involved in this concerto are a flute, two oboes, two clarinets, two Bbssoons, two horns, timpani and strings. 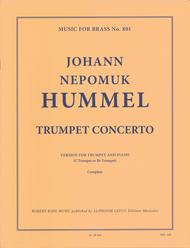 Hummel's Trumpet Concerto begins with an orchestra only first movement, in a sonata theme which is repeated with the inclusion of the soloist. This Allegro Spirito sounds reminiscent of the Haffner Symphony (No. 35 in D Major) by Mozart but distinguished itself by a second theme. The second movement, Andante, is more melodic, with the trumpet which holds long notes. Finally, the Rondo offers a blissful and bright end to the Concerto. A former student of Mozart, Johann Nepomuk Hummel (1778-1837) was a brilliant composer, pianist, conductor and teacher. Evolving at the same period as Beethoven, he became as famous as him and wrote numerous concertos (for Piano, Oboe, Trumpet, Violin and others), operas and some wind music pieces.